"She is a full-time single mother, a business owner, a cannabis advocate, a model, a photographer and a trailblazer in both the fitness and cannabis communities. In fact, Jennessa's tale is not all that different from those of our favorite storybook characters. She was able to rise above dreadful circumstances to become an empowered leader who now enables others to do the same through Break The Stigma Fitness." - Now This: WEED Media Video released January 2018 that has over 7 Million views! "From a wheelchair to a 5K, a medical marijuana patient crediting cannabis for helping her change her life." "For most of her life, Lea struggled with health issues. Growing up, she suffered from severe pain in her joints and muscles, pain doctors couldn’t explain and dismissed with every opioid in the book. But when she had her daughter at 20, her health took a turn for even worse. Her condition began to spiral out of control." "Fast forward to the last few years and Jennessa Lea has become a prominent social media influencer with workout videos and cool Instagram posts that show she is a force to be reckoned with. Browne asked her how she decided she wanted to get into posting online and helping people. Lea said, “I just want to reach people. I want people to know the power is within them, they have the ability to control their destiny and their future". "Eventually, Lea was taking 150 mg of oxycodone and 90 mg of morphine every day. Her tolerance to the opiates kept increasing so, as is often the case, her doctors upped her doses. To help her build muscle, which is imperative for supporting weak joints, Lea was told to begin physical therapy. But since she was on so many narcotics, exercising was impossible as she was exhausted all the time. As a young mother to a daughter, Lea knew something had to change. And so she decided to try cannabis." Lea is now making videos and reaching people as a motivational speaker to inform people that they do not have to feed in to what doctors are telling them, that they can no longer do things, and sharing her story and the message she believes will help people. 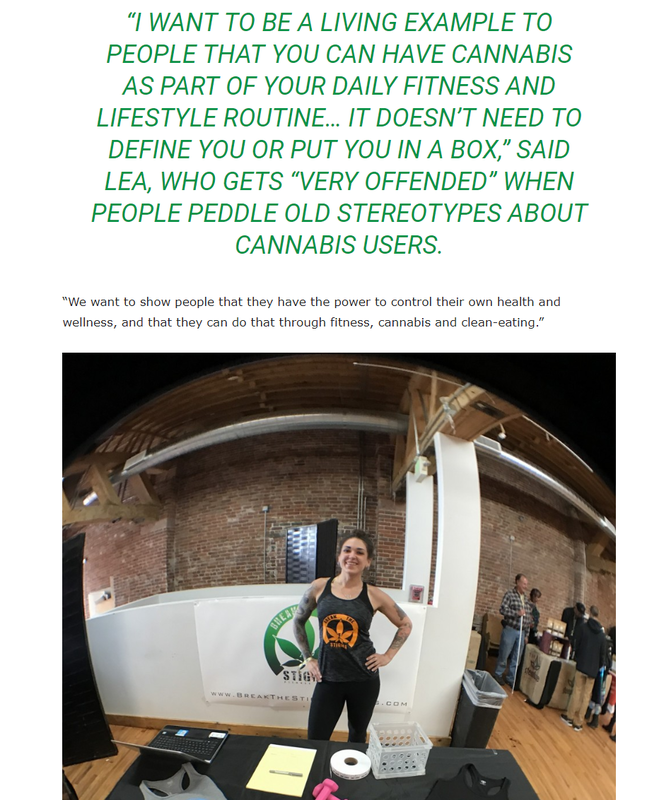 Lea fights through her workouts with the pain, and able to run faster and longer, and while using cannabis and working out she feels less pain after the workout and enjoys being sore rather than being in a extreme amount of pain. Lea has specific strains she uses depending on her needs. 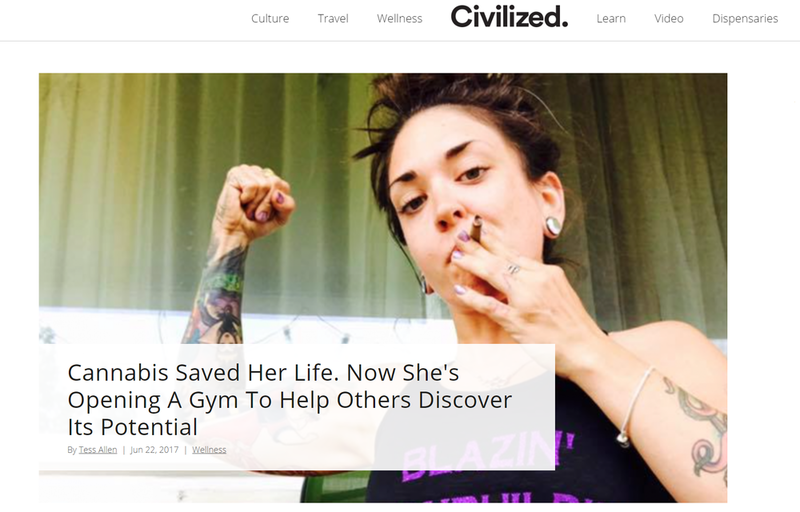 She not only smokes, but ingests edibles, uses oils, as well as topical treatments that are infused with cannabis." It’s so cliche, but I must admit–the new year inspires me to set new fitness goals. And sticking to new goals is so much easier if you’re enjoying yourself. Makes sense right? I came to the Break the Stigma Fitness IG page for the #yoga and #dabs. 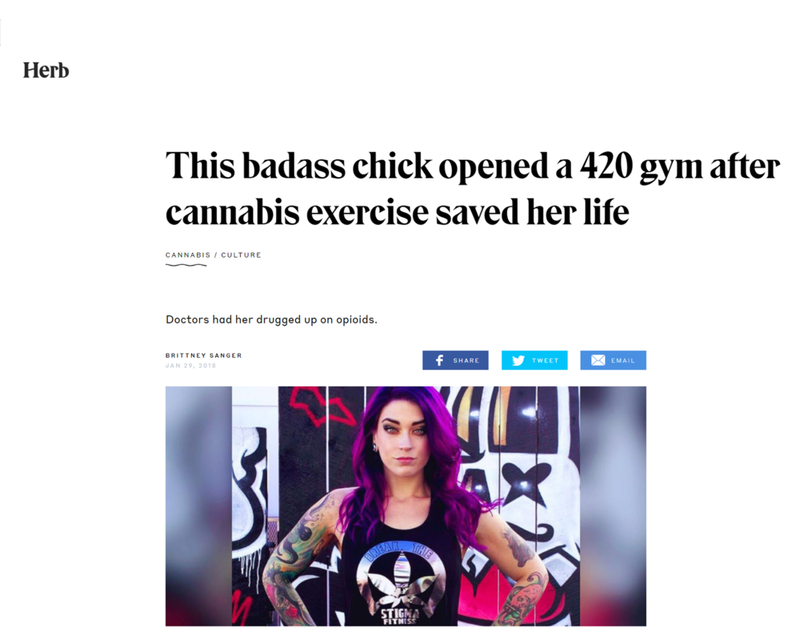 I stayed for the inspirational #420athletics and #cannabiscommunity. 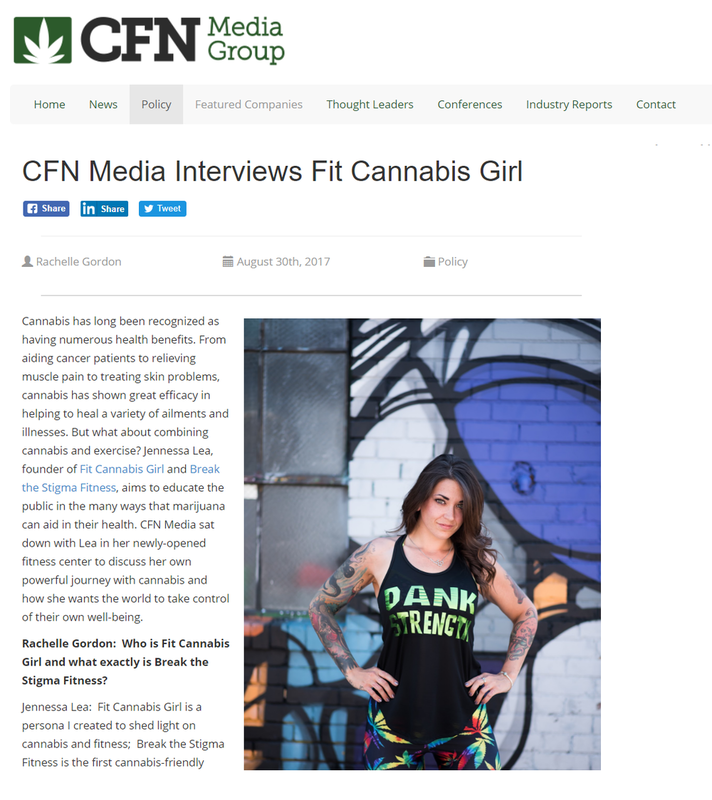 Founder and owner Jennessa Lea and her team of Canna Coaches are bringing cannabis, fitness, health and wellness together in a safe, fun, informative, and challenging way. 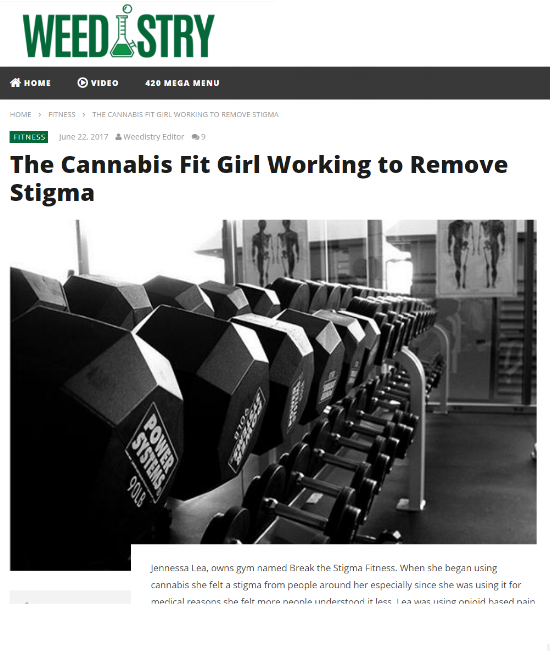 She started the blog Fit Cannabis Girl and, in 2017, opened Break The Stigma Fitness, a facility that offers cannabis-friendly fitness classes, nutritional advice and workshops. That’s the kind of resolve we hope to put behind our New Year’s resolutions for 2018." "My mission is to educate and inspire individuals to take control over their own health and wellness with a combination therapy of cannabis, fitness, and clean eating. I want to encourage and remind everyone YOU have the power. If you want it, you can achieve it!" 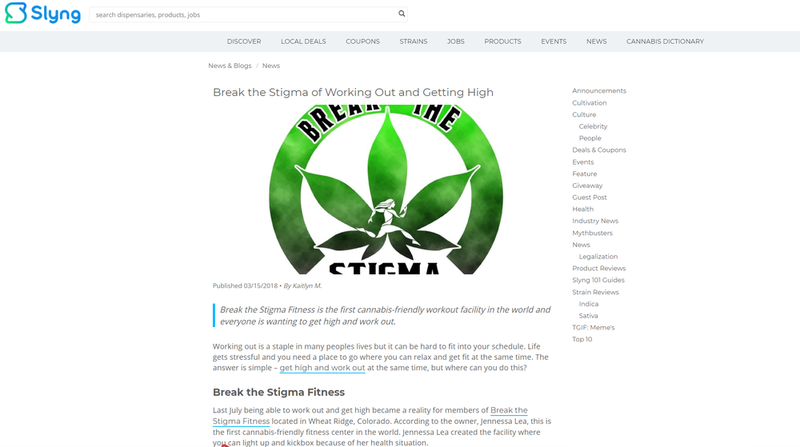 "I definitely see this concept being popular and people really appreciating the idea of breaking that stigma. I think a lot of people who use cannabis are sick of being grouped into that “lazy stoner” crowd. 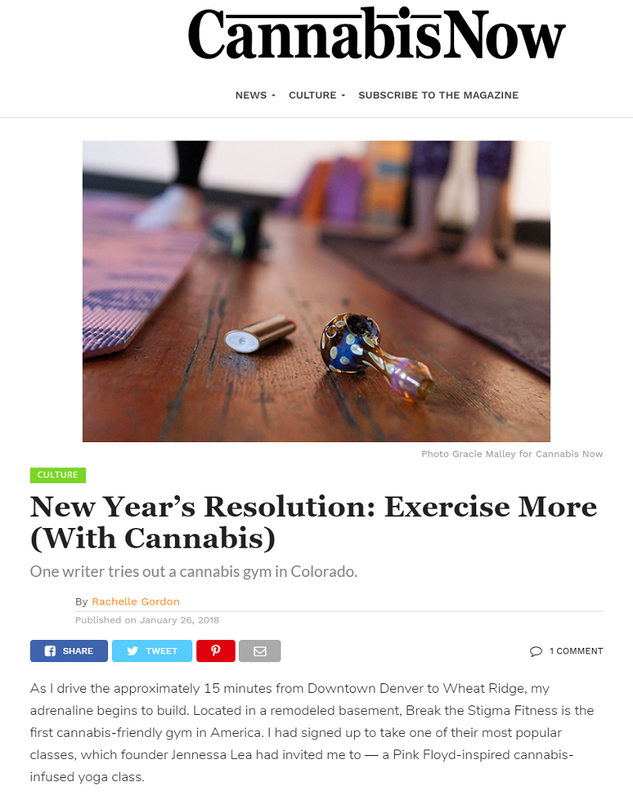 We are proud that we medicate with cannabis and we use it in our daily fitness routine. I want to remind people that they have the ability to control their own health and wellness and that you don’t need to rely on doctors and pharmaceuticals. You can achieve great things if you believe in yourself and you take care of yourself." My first time testifying in hopes I could influence positive policy change surrounding cannabis. Jennessa Lea, 27, of North St. Paul, was among people who wanted a more liberal law. She and her 6-year-old daughter, Raegan, suffer from Ehlers-Danlos syndrome, a group of inherited disorders that affect connective tissues. Lea said smoking cannabis diminishes the pain enough that she may play with her daughter. 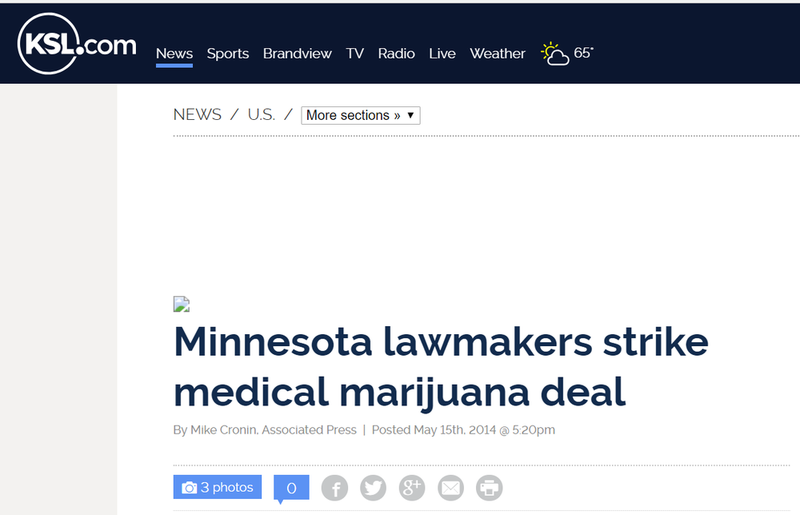 "That's why we need the whole plant," Lea said, choking up during an interview after the Thursday news conference. "I can't function when I'm taking only oxycodone to cope." "Jennessa Lea has Ehlers-Danlos syndrome — a rare and painful illness that essentially affects the collagen in her skin, joints and blood vessels. 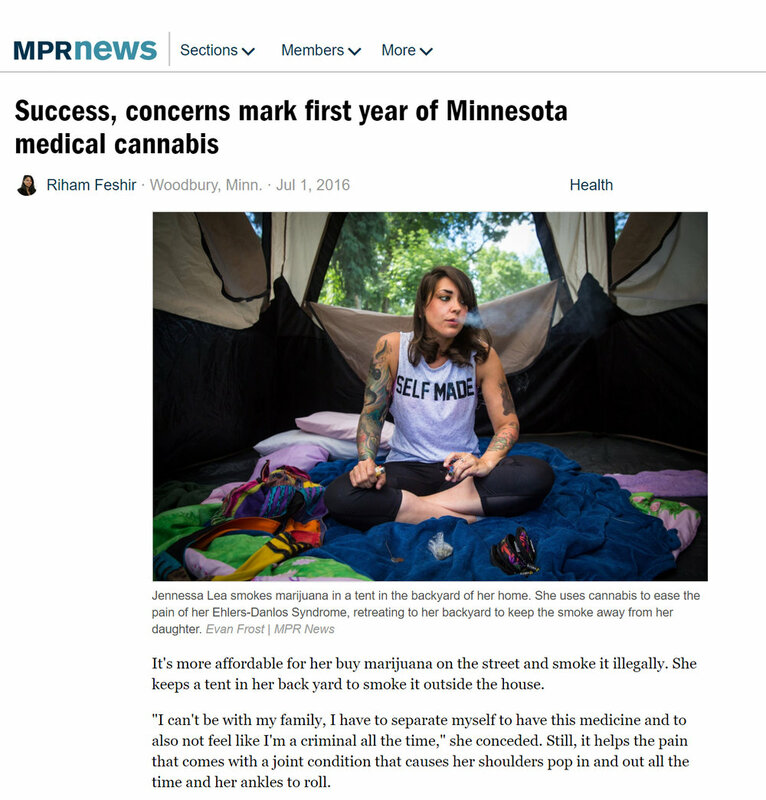 Lea has to wear a brace around her knee when she walks to keep her patella from dislocating, and she wears braces around her fingers to keep them from bending “past the point of no return.”"
"Those high prices have prompted Jennessa Lea to return to buying marijuana on the street to treat a painful condition called Ehlers-Danlos Syndrome. She's one of several patients who have told The Associated Press they've reverted to the black market due to state-approved medications' high costs, which can quickly rack up into hundreds or thousands of dollars for a month's supply. "We have these places here that are supposed to be attainable ... and there's still so much red tape," Lea told the task force." "Jennessa Lea of St. Paul endures pain from Ehlers Danlos Syndrome. 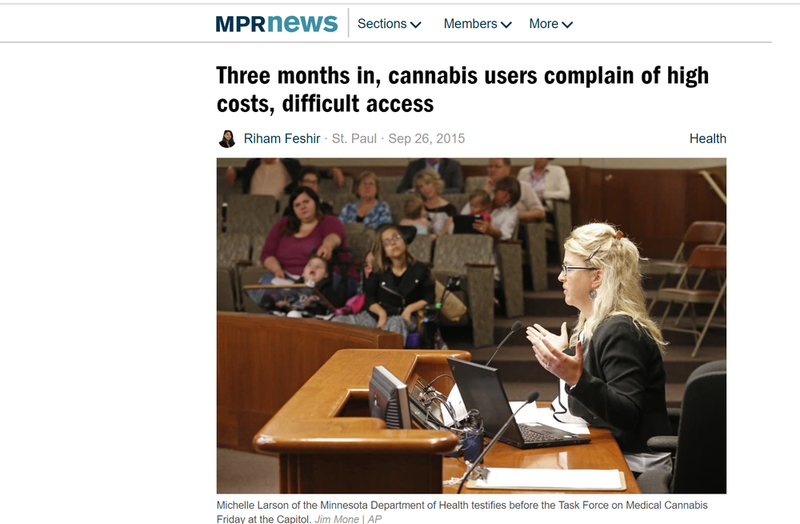 The 28-year-old single mother testified at the Minnesota Medical Cannabis Task Force meeting Friday that after she was prescribed narcotics at the age of 21, dependence turned her life upside down. Cannabis was the safest alternative to opiates without the dangerous side effects, she said." 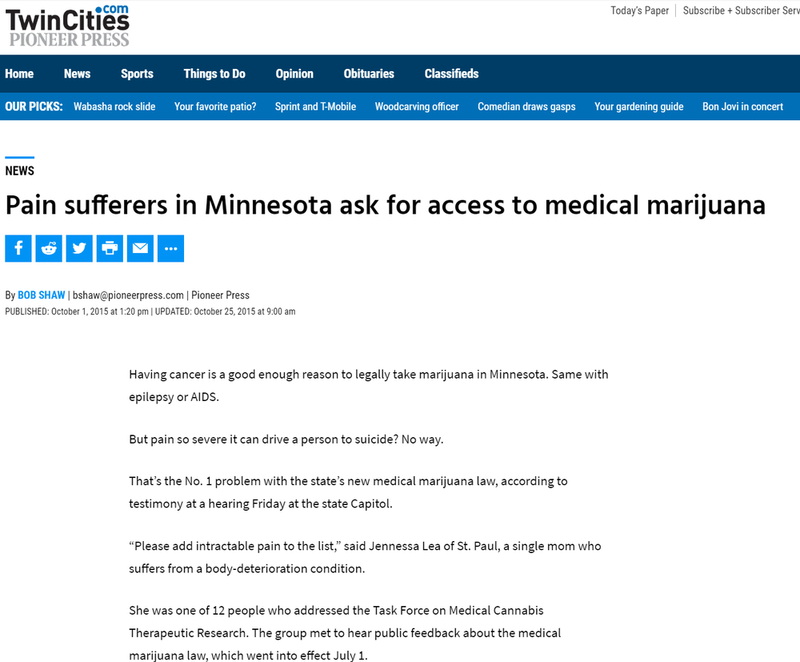 “Please add intractable pain to the list,” said Jennessa Lea of St. Paul, a single mom who suffers from a body-deterioration condition. She was one of 12 people who addressed the Task Force on Medical Cannabis Therapeutic Research. The group met to hear public feedback about the medical marijuana law, which went into effect July 1." "I can't be with my family, I have to separate myself to have this medicine and to also not feel like I'm a criminal all the time," she conceded. Still, it helps the pain that comes with a joint condition that causes her shoulders pop in and out all the time and her ankles to roll.